Mobile Chowdown is back–this time with beer! The food truck extravaganza will be October 1 at the Qwest Field north parking lot from 5:00-10:00 p.m. It now costs $5 to get into the event, which is 21+ because of the alcohol factor. Pyramid Breweries is the official beer sponsor. In addition to your favorite food trucks, there will be a live music stage featuring DJ Riz, Bandolier, Haiku-Chi and Piece. I’d also be interested in trying food from Buns on Wheels and Street Treats and I definitely want to check out Domo Dogs from Portland. I’ve always loved the idea of a Sunday dinner–a time when your family comes together to eat something special and spend time together before the start of another long week. Though my parents never did this when I grew up, the Sunday dinner is a tradition that I want to start with my own family. Last week, I made the first of what I hope are many Sunday dinners. Since it’s now officially autumn, and the weather was crisp that day, I decided to make some classic comfort food–roasted pork loin, mashed potatoes with mushroom gravy, green beans and an apple galette for dessert. I think I finally now how to cook! I was spending a rare Sunday afternoon alone at home and trying to decide what to have for lunch. I hadn’t gone grocery shopping in awhile so there wasn’t much in the fridge, but I was too lazy to go out and eat. I took another look in the fridge, and I saw that I had half an onion, a red bell pepper, part of a large zucchini, two carrots and some dill that was about to go bad. Then I remembered I had some couscous in my pantry. 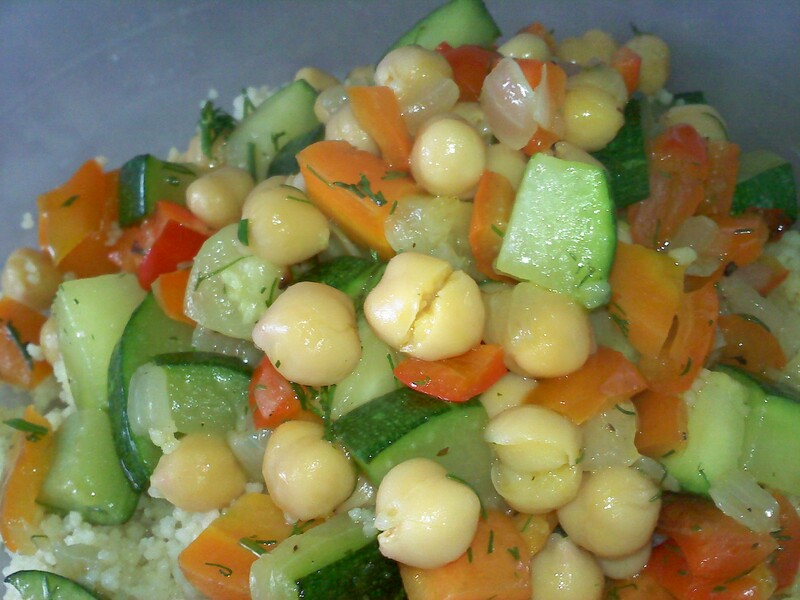 I decided to sauté the vegetables and then serve them on a bed of couscous tossed with brown butter. I almost always cook by recipe, but I’ve been trying to wean myself from constantly following directions and actually cook. I love sliders so when I saw Sarah Lee mini buns on sale at the grocery store, I just had to buy them. Finally, I could make my own sliders at home! 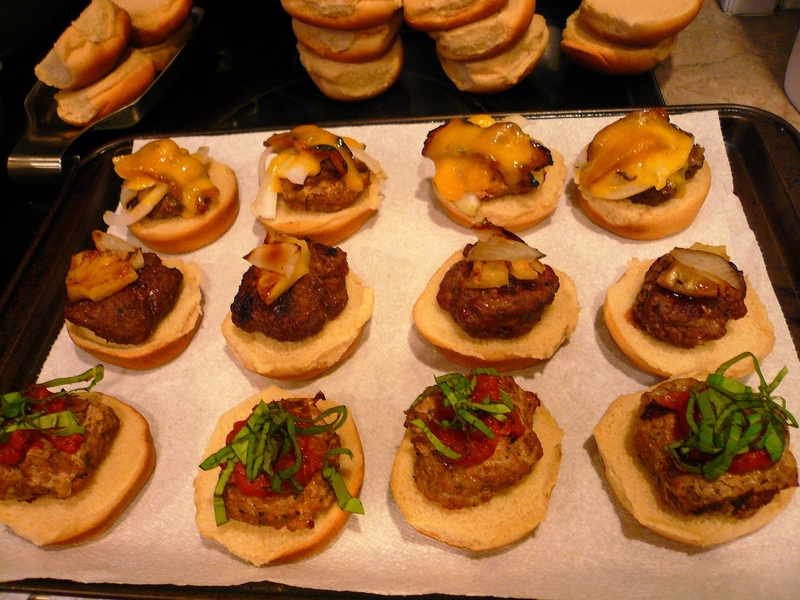 Since 12 buns come in a pack, I decided to make a dozen mini burgers one night for my family. I wanted to make a couple different versions and went with one traditional and two variations. I made a classic burger with ground turkey flavored with grill seasoning and topped with bacon, cheddar and white onion. My “Hawaiian” burger was ground sirloin with some Yoshida’s sauce mixed in with a little salt and pepper. I also added grilled pineapple and carmelized onions. The third type of slider I made incorporated Italian flavors. I seasoned ground turkey with oregano, salt and pepper and added in some asiago cheese. I served it with marinara sauce and fresh basil. It was an interesting experience working as an event volunteer last weekend at the International Food Blogger Conference. I stuffed swag bags, alphabetized name badges, registered attendees, prepared platters of food, broke down literally hundreds of cardboard boxes and hauled trash. I even had a flashback to my college days as a barista when I spent two hours doing nothing other than brewing coffee. The biggest perk of this job was that I got to eat some amazing food: lamp chops with a wasabi crust, mini beef bahn mi sandwiches by Lisa Dupar, steak tartare personally prepared and served by Daisley Gordon of Campagne, geoduck ceviche and all the Theo Chocolate I wanted. I also got to see and hear from Morgan Spurlock of “Supersize Me,” fame, “Saveur” magazine editor-in-chief James Oseland and other famous food folk.